If you’re currently in the middle of wedding planning, you’ve probably been falling head over heels with different wedding invitation options. This is a creative area where couples can have fun and customize an invite for their dream wedding just the way they want to. However, it’s important to be aware of the common mistakes that couples make when it comes to wedding invitations. Avoid the following missteps! 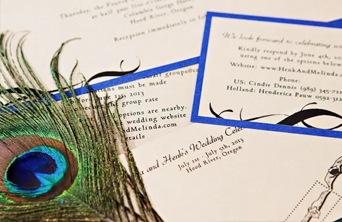 When couples go to a stationer to discuss wedding invitations and get a quote, many stationers don’t include postage costs in your quote because they don’t want to deter you from getting those elaborate or fancy (i.e., heavier) invitations. The postage for wedding invites alone can add up to hundreds of dollars, depending on the amount of guests you have and the type of invitations you get. It’s not only the cost of mailing them out; it’s also the cost of the reply envelope stamps. In order to get a full quote on wedding invitation postage, you should have the stationer weigh a sample invite, and remember to include the reply envelope stamp for each invite, too. Remember, you don’t need an invitation for every guest. You just need one for each household. It may sound silly, but this is a very common mistake that couples make, and it can actually double the amount of invites that you actually need. Separate your guest list by household, and go from there. Your wedding invitations are the first impression of your wedding that guests will have (besides your save the dates, which are more casual). Therefore, your wedding invites should reflect your wedding’s theme as closely as possible. If you’re still figuring out some aspects of your wedding planning, you may not have yet chosen your wedding colors, theme, or style—but you will at least know if you’re having a lavish banquet hall wedding, a beachside ceremony, a formal church wedding, a backyard barbecue style wedding, etc. Your wedding invitations should match the tone, if not the theme and colors, of your wedding. Color is great. Color is beautiful. And many couples want their wedding invitations to really POP. However, don’t go bananas! The last thing you want is for your wedding invitations to look like a kid’s birthday party invite. Balance colors out that’s eye-pleasing, and get an expert’s opinion as well. Bright colors should be paired with neutrals, and the text should always be very visible and easy to read. A good rule of thumb for wedding invitation colors is 3-5 colors, with one or two of those colors being neutral (such as gold, ivory, or eggshell). When it comes to your wedding invitations, you’ll want them to be perfect. Read over them again and again—and then ask someone else to. And then ask a third person. Ask as many people as it takes in order to make 100% sure there are no mistakes. This includes dates, times, and addresses as well as spelling and grammar problems. Wedding planning leaves very little time, but this is an important area. It’s even a great idea to order an invitation proof in order to catch any last-minute errors. At De Luxe Banquet Hall, we are experts in the wedding industry. If you’re currently in the middle of wedding planning and trying to find the perfect Los Angeles wedding venue as well as an experienced team of wedding planners, please contact us. Take a look at our photo gallery, or check our pricing and availability.